Almost all exercise, when done safely, have life-changing benefits that can keep you healthy and strong for years to come. The more consistent you are with your exercise, the more benefits you will see. However, low-impact exercise offers specific, holistic benefits that many high-impact exercises simply cannot offer. 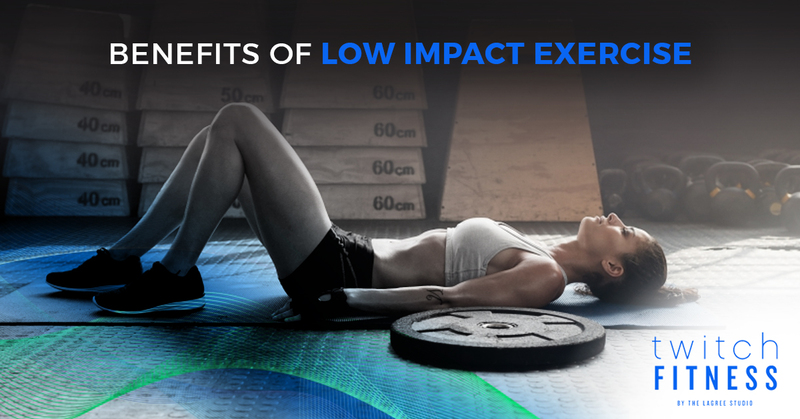 By engaging in low or no-impact exercise, you can see various benefits. What Is A Low Impact Exercise? There are two main distinctions between types of exercise: high-impact and low-impact. High-impact exercise might sound like it’s reserved for wrestlers and football players, but it can really be any activity where there is either impact with another person, or internal impact on your joints. One of the most common types of high-impact exercise is running. While running is great for your heart health, overtime frequent jogs around the block can wear down joints and muscles over time. On the other hand, low-impact exercise is any exercise that doesn’t involve directly pounding your feet on the pavement or your fists on an opponent. But don’t think that low-impact means low-effort. Low-impact exercises can get your heart rate up sometimes higher than high-impact exercises. Exercises like swimming or using the elliptical machine are great ways to move your muscles while using resistance to get your heart pumping. Healthier Joints For The Long-Term: While your twenty-something body might have been fine hitting the track every day, by the time you reach your 40s or 50s, you may have done more harm than good to your joints. Over time, the soft cartilage that cushions your joints wears down, and the more impact those joints are exposed to, the quicker it deteriorates. While some running here and it is completely healthy, be sure to listen to your body and not over-do it. Additionally, low-impact exercise is an awesome way for those who already have joint pain to experience intense exercise and lose weight. Better Heart Health: High-intensity, low-impact exercise can still be cardio – an aerobic exercise that increases the heart and breathing rates for sustained periods. Studies have shown that low-impact exercise several times per week can help lower the risk of heart disease and problems by creating better circulation and controlling high blood pressure. Good For Weight Loss: Low-impact exercise like we offer at Twitch Fitness can burn hundreds of calories per session, which can result in significant weight loss when combined with a healthy diet. Our InBody Analysis can analyze your body composition so you’ll know exactly how much fat you are losing. Mental Benefits: A while ago we talked about how exercise benefits your mental health. Since many low-impact exercises are often experienced in a group exercise class, the mental health benefits increase greatly. Not only are you releasing all those feel-good brain chemicals, studies have shown that spending time with others is also a good mood-booster. More Stability: By using controlled movements rather than momentum, you are able to gain better control over your muscles. When you run or do another high impact exercise, you rely a lot on momentum to perform various exercises. Using slow, controlled motions helps to increase overall stability throughout your core. At Twitch, by The Lagree Studio our T3 Approach is designed to give one of the most intense workouts you’ll ever experience, without impact on your joints. Using slow, controlled movements on a megaformer machine or versaclimber, the T3 Approach activates both slow and fast twitch muscle fibers for a whole-body workout. To get involved and start Twitching, book a class today!